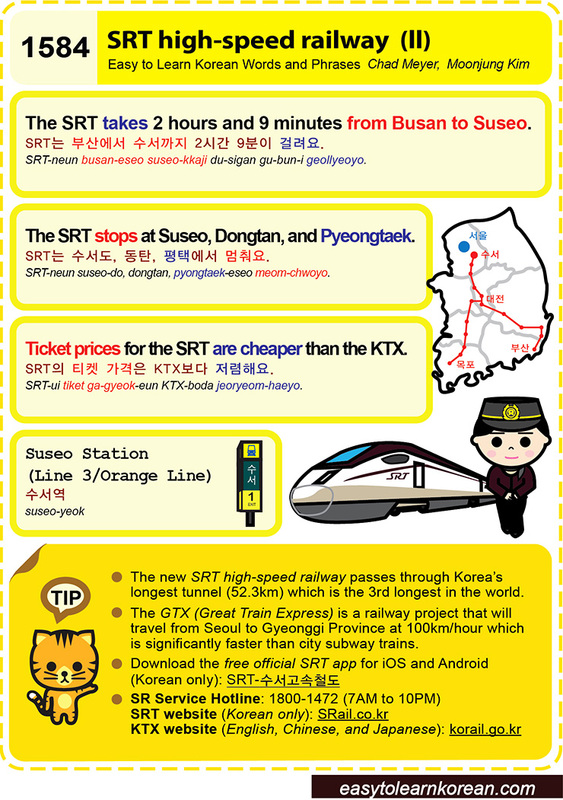 This entry was posted in Series and tagged (Line 3/Orange Line), and Pyeongtaek., Dongtan, Great Train Express, GTX, Gyeonggi Province, korail.go.kr, KTX, Seoul, SRail.co.kr, SRT, SRT app, SRT는 부산에서 수서까지 2시간 9분이 걸려요., SRT는 수서도, SRT의 티켓 가격은 KTX보다 저렴해요., Suseo Station, The SRT stops at Suseo, The SRT takes 2 hours and 9 minutes from Busan to Suseo., Ticket prices for the SRT are cheaper than the KTX., train, tunnel, 동탄, 수서역, 평택에서 멈춰요. by easykorean. Bookmark the permalink.